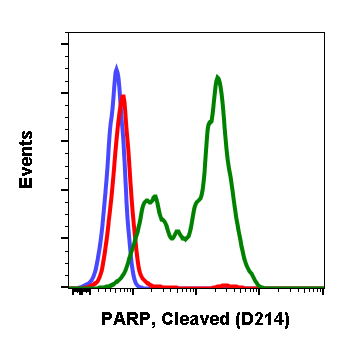 Poly-ADP-ribose polymerase 1 (PARP-1), is a substrate of caspase-3 and caspase-7, both of which play a dominant role in apoptosis. 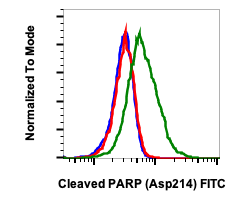 PARP is cleaved into 89 and 24 kDa fragments at Asp214. The detection of these fragments is used as an indicator of caspase activation and apoptosis induction for many cell lines. 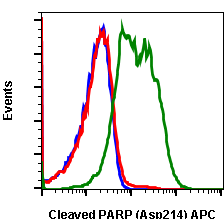 Under normal conditions, PARP aids in the detection and repair of DNA damage. 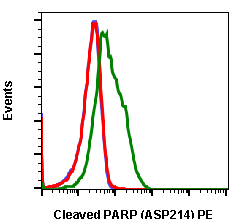 With 1-2 million copies per nucleus, PARP is also involved in poly (ADP-ribosyl)ation, a post-translational protein modification mechanism used to modify chromatin structure and regulate transcription. Decreased PARP activity has been shown to lead to loss of memory and neuronal cell death. Bressenot A, Marchal S, Bezdetnaya L, Garrier J, Guillemin F, and Plenat F. (2009) Journal of Histochemistry and Cytochemistry. 57: 289-300. Chaitanya GV, Alexander JS, and Babu, PP. (2010) Cell Communication and Signaling. 8:31. Kraus WL, and Lis JT. (2003) Cell. 113:677-683. 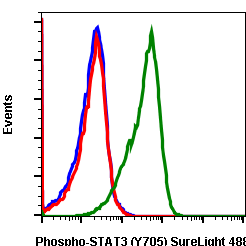 Flow cytometric analysis of SK.N.MC cells unstained and untreated as negative control (blue) or stained untreated (red) or treated with staurosporine (green) using Cleaved PARP (Asp214) antibody PARP-H8 PE conjugate. Cat. #2332.